All that glitters is gold at the new Swisshorn Gold Palace, which opened in Hong Kong on 23 September 2006. The 7,000 square foot tourist attraction, has taken HK$ 400 million (£270 million), two and a half tonnes of gold and five years to make, and has pure gold features - everything from a gold bed, sofa and coffee table to bath tub, toilet, washroom and dressing table. Dr Lam Sai-Wing, of the Hang Fang Gold Technology Group, designed the room with a European architectural feel. 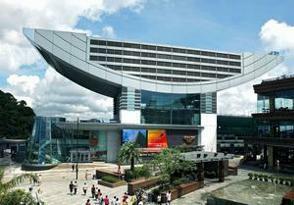 He is expecting 2 - 3,000 visitors a day, each paying $HK 25 (around £1.70) for entrance. The palace will be open from 9am – 5pm daily. Those with a bit more to spend can pay HK$200,000 (£13,518) to stay an entire night, sleeping on the gold bed. Nobu, the world famous Japanese restaurant chain, opened its first Asian premises this November at the InterContinental, Hong Kong. As well as creating dishes from local ingredients, the new eatery will also showcase the chain’s signature dishes such as fresh yellowtail sashimi with jalapeno and broiled black cod with miso. The restaurant, designed by the Rockwell Group, has a dining room which commands superb harbour views, while providing an intimate dining experience. It will also have a bar lounge, sushi bar and private dining area for special events. Hong Kong has been chosen as the second destination after London to open a M1NT private member’s club this November 2006. Already a huge success in the UK with celebrities, billionaires and royalty alike, M1NT Hong Kong has a unique twist in that the first 250 members own the club themselves. A second tier of 1,000 traditional members paying annual fees will have access to the club and form the waiting list for shares. M1NT Hong Kong will offer all the finest trappings of a luxury lifestyle, including the hottest night spot in town, all day business facilities, use of a fleet of Black M1NT Range Rovers and access to exclusive global travel and entertainment discounts. Following the Mandarin Oriental’s $140 million refurbishment, two new restaurants and a new bar have opened at the legendary establishment this autumn. Pierre Gagnaire, three-star Michelin chef from London’s Sketch, has arrived to open ‘Pierre’ – a contemporary restaurant overlooking Victoria harbour. ‘The Mandarin Grill & Bar’ has been developed by Sir Terence Conran, with views of Statue Square and Chater Garden. A new Crustacea bar has been created, where diners can enjoy sashimi specialties and oysters. Perched on the top of the hotel, M Bar has just opened with stunning harbour and city views. Champagnes and speciality cocktails created by renowned mixologist Angus Winchester are accompanied by tapas from the hotel’s Chinese restaurant, Man Wah. Bringing a little Caribbean sunshine to Hong Kong’s Lantau Island from November 2006, is new restaurant and bar Hemingway’s by the Bay. Hemingway’s is a smoke free eatery serving Caribbean and Key West food, right next to the beach at the Discovery Bay Plaza. There is an outdoor deck area to enjoy bayside dining, as well as a bar serving an extensive wine list, imported beers and rums from distant shores. Boutique hotel The Fleming opened in Wan Chai district this October, with 66 rooms in a contemporary, stylish and minimalist yet cosy design. Women travellers can benefit from the dedicated female only floor, with rooms providing beauty kits, jewellery boxes and facial steamers. Spaced over 14 floors in total, all rooms feature up-to-date facilities, including wireless/ wired broadband, plasma/ LCD TV and goose-down duvets and luxury linen. Deluxe and executive rooms have their own kitchenette, DVD home theatre unit and leg massage machine. The Peak Tower, a huge viewing platform at the summit of Hong Kong’s leading tourist destination, The Peak, had its grand opening on November 14, 2006, after an extensive revitalisation programme. Visitors can now experience spectacular 360-degree views of Hong Kong’s striking skyline of skyscrapers and mountains, from its new rooftop Viewing Terrace and Sky Gallery, with its showcase of local artworks. The Peak Tower also has a festival market style shopping arcade, with shops ranging from specialist crystal and gemstone accessories, to international chocolate and sweets, traditional Chinese clothing and medicines, skincare, homeware, jewellery and watches. Four signature restaurants – all with stunning vistas – have recently opened. The Chinese eatery Tien Yi, Pearl on the Peak, which is expected to emulate the success of its original Melbourne namesake, the Japanese Kyo Hatchi and American seafood eatery Bubba Gump. Hong Kong’s popular Design Gallery, the product emporium which showcases the city’s latest quality innovations and designs, is due to open its second outlet at Hong Kong International Airport in January 2007. Last-minute shoppers will be able to purchase from an extensive range of products such as clocks, watches, stationery, electronics, jewellery and aesthetic ornaments. Run by the Hong Kong Trade Development Council, the gallery will be located at level 7 in the departure hall, with opening hours from 7:30am to 10:30pm, Monday to Friday. The Hong Kong Tourism Board has recently launched Hong Kong Mobile Host, a revolutionary dial-up audio guide to the city provided direct to visitor’s mobile phones. The new service, developed in cooperation with five local mobile phone networks, operates on all GSM handsets. It provides lively on-the-spot commentary on attractions, hot shopping news, dining recommendations and event information in English, Putonghua (standard Mandarin) and Cantonese. Visitors can choose to purchase a three-day (72-hour) pass at HK$60 (just over £4), which offers unlimited audio access to the service using a roaming SIM-card without incurring any additional charges. Hong Kong’s total visitor numbers for the first nine months of 2006 have reached a record 18.5 million, according to new statistics just released by the Hong Kong Tourism Board (HKTB). Representing an increase of 9.5 per cent on the January-September period in 2005, the figures underline the high consumer profile and desirability achieved by Hong Kong globally this year. Growth from the UK has also been impressive - up 8.1 per cent with a total of 355,010 arrivals between January and September 2006. Hong Kong’s enduring appeal for British travellers shows no sign of abating; the destination has just been voted Favourite Overseas City in the 2006 Guardian, Observer & Guardian Unlimited Travel Awards. Getting to Hong Kong has never been easier - from November 2006 travellers will have 77 non-stop flights each week from London to choose from. This year has seen the introduction of 17 new flights, representing a 28.3 per cent increase in capacity since December 2005 and underlining the UK market’s continuing love affair with Hong Kong. Key developments included the launch in October of the first-ever low-fare carrier to the Far East - Oasis Hong Kong Airlines, offering one-way travel to Hong Kong from London Gatwick from just £75 plus tax - and the introduction of daily services from London Heathrow by Air New Zealand. Between November 24, 2006 and January 1, 2007 Hong Kong will be transformed into a winter wonderland full of festive sights and sounds. Visitors should head to the dazzling Christmas display in Santa Town (Statue Square) where the centrepiece is the giant Christmas tree, festooned with lights making it a great seasonal landmark in the heart of Central district. The tree will be lit from 6pm to 11pm each night. The special atmosphere will be enhanced by evening festive performances and Christmas carols, performed by local and international groups, taking place at weekends and on festive days. Shopping for Christmas gifts will also be easy with discounts of up to 70 per cent at thousands of shops and dining outlets. Chinese New Year, February 18 - 20, 2007. Join in Hong Kong’s most colourful celebration of sparkling lights, elaborate floats and international musical groups and marching bands they dance through the city in celebration of the year of the pig. Chinese New Year is a time of family togetherness, renewal and celebration. Birthday of Che Kung, February 19, 2007. Che Kung was a Sung Dynasty general immortalised for saving villagers from the Sha Tin Valley from a plague. Thousands of locals flock to his temple to wish him a happy birthday, believing that he will bring them luck for the year. Celebrations take place at the Che Kung Temple in Sha Tin. Hong Kong Arts Festival, February 27 – March 25, 2007. The 35th annual Hong Kong Arts Festival is a month long cultural feast offering art and music performances from around the world, including dance, theatre, circus, opera and Chinese opera. Spring Lantern Festival,, March 4, 2007. This romantic festival is celebrated at the end of Chinese New Year, and is similar to our Valentine’s Day. Lanterns are lit all across the region, and single people use them for matchmaking games. Hong Kong Rugby Sevens, March 30 – April 1, 2007. Tens of thousands of fans from around the world descend on Hong Kong for three days of thrilling rugby from 24 international sides at the state-of-the-art Hong Kong Stadium. The city takes on a carnival atmosphere as bars and clubs throw open their doors to rugby fans, over a weekend justly famous for its bonhomie and warmth. Birthday of Tin Hau,, May 9, 2007. The goddess of sea, Tin Hau, is honoured by parades, floral paper tributes and ribbon-adorned boats. Locals bring offers of fruit to the many Tin Hau temples scattered across the region.